Autumn colored trees tower over the roadway which follows the Jacques-Cartier River in Jacques-Cartier Provincial Park in Quebec, Canada. Traveling the road along the Jacques-Cartier River in Jacques-Cartier Provincial Park in Quebec, Canada during the Autumn season brings a magical display of color to the trees. As the leaves slowly drop from the trees above, the road is scattered with Autumn leaves with piles of them building up along the roadside. Chemin de la Vallee, alongside the Riviere Jacques-Cartier, Jacques Cartier River, in the river valley surrounded by fall colours in Parc de la Jacques-Cartier, Quebec, Canada. 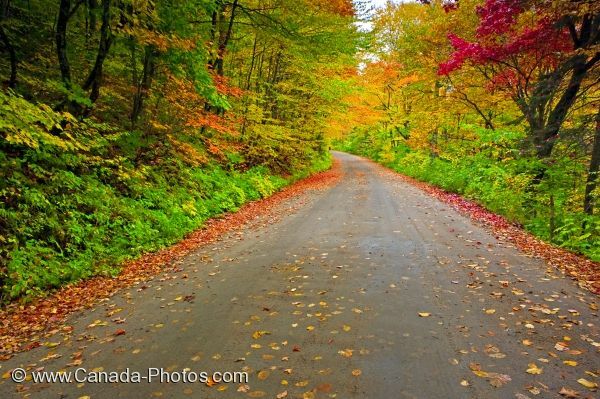 Picture of the Autumn leaves that blanket the road through Jacques-Cartier Provincial Park in Quebec, Canada.